This early morning i receive a reply from my friends telling me that i forgot to attach the files, and just imagine if your mail client can warn you about this. Now, its not just a myth :), yes its true. New google labs forgotten attachment detector will save my (your) face, eventhough im also using Evolution (i`m hoping another mail client will develop this kind of feature) for my jobs/works email. 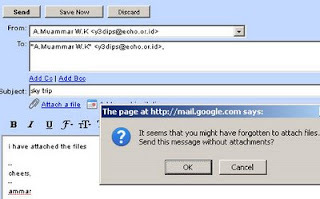 Forgotten attachment detector is created by Jonathan K, ones of Google labs developer, it will prevents us from accidentally sending a message without the relevant attachments. Prompts you if you mention attaching a file, but forgot to do so. 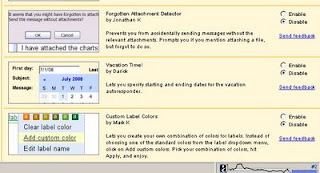 To activate this feature just choose it under "Labs" tab under "Gmail Settings" and find the Forgotten attachment detector created by Jonathan K at the bottom.